Background: Cancer was and still a very stressful and urgent disease condition representing a leading cause of death in developed as well as developing countries. Although, much research work in both medical and pharmaceutical fields has evolved in the past few years in addition to some promising clinical trials and few market products, cancer becomes much wilder, threatening and getting more lives. Most approaches have focused on the synthesis of new active ingredients or chemical modification of available ones, formulating them in suitable dosage forms aiming for targeted and effective drug delivery with minimal side effects. Method: Recently, application of nanotechnology through formulation of nanocarriers has acquired much more attention in treating different types of cancer tumors. 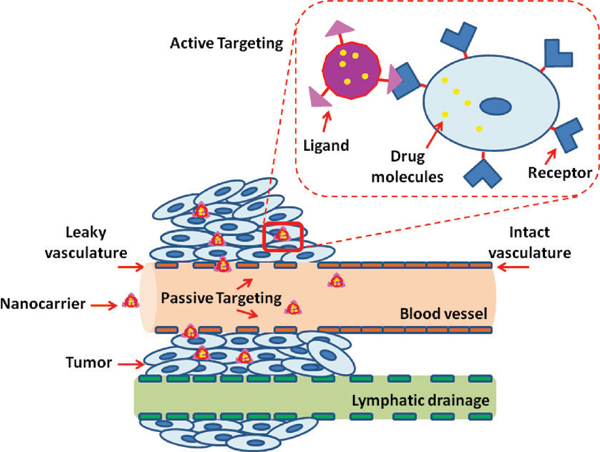 Being explored in cancer therapy, nanocarriers have shown a promising capability to enhance intracellular uptake of active agents, promoting their accumulation in the tumor mass in addition to the reduction of the cellular toxicity compared to conventional chemotherapeutics. Results: In view of the above findings, this review discusses recent advances in nanotechnology-based carriers for cancer drug delivery, providing detailed description of different nanocarriers from historical perspective since the first developed carrier up to the new strategies adopted to formulate novel multifunctional targeted nanocarriers for cancer therapy. Conclusion: The findings of this review illustrate the potential of nanotechnology-based carriers as an emerging technology for more satisfying and selective cancer therapy. Keywords: Active targeting, cancer, combination therapy, nanocarriers, nanotechnology, stimuli-responsive controlled release, tumors. Keywords:Active targeting, cancer, combination therapy, nanocarriers, nanotechnology, stimuli-responsive controlled release, tumors. Abstract:Background: Cancer was and still a very stressful and urgent disease condition representing a leading cause of death in developed as well as developing countries. Although, much research work in both medical and pharmaceutical fields has evolved in the past few years in addition to some promising clinical trials and few market products, cancer becomes much wilder, threatening and getting more lives. Most approaches have focused on the synthesis of new active ingredients or chemical modification of available ones, formulating them in suitable dosage forms aiming for targeted and effective drug delivery with minimal side effects.